Auditioning in NYC? Visiting for the first time? Finding affordable ground transportation to and from the area airports is easier than it used to be, though it requires some research and planning to go smoothly. There are many airport transportation alternatives to an expensive taxi ride or begging a ride from the one friend you know in the city with a car. Speaking of begging, have you heard about CabCorner.com? It’s a site to find other people to share a taxicab ride to and from the airport. We haven’t tried it, but it sounds promising. The M60 bus goes to LaGuardia Airport from several points in Manhattan and Queens. From uptown Manhattan, the M60 will take around an hour or more to get you to your terminal. Take the subway to the nearest stop on the M60 bus. The entire trip costs just one subway fare. For JFK Airport, take the Long Island Rail Road (LIRR) or the A , E, J or Z subway lines to connect with the AirTrain, a monorail shuttle that travels between nearby subway and LIRR stops. Via the subway will cost you one subway fare + the (minimal) cost of the AirTrain. The LIRR trip is slightly more expensive than the subway, but can be faster. Check the AirTrain web site for more details. 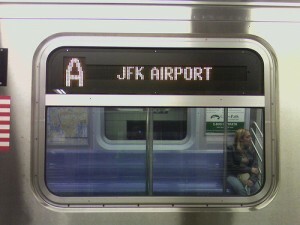 There’s also AirTrain service between Newark Liberty Airport and New York Penn Station. At New York Penn Station, go to the NJ Transit area and buy a train ticket to the airport. It’ll generally be the third stop. When you get off, you need to buy an AirTrain ticket and then transfer to the AirTrain that takes you to the various terminals and parking areas. Visit Newark’s AirTrain web site for more information. Take a subway or bus to New York Port Authority (near Times Square) or Grand Central on the East Side and catch the Olympic Trails shuttle bus. The ride is around $16 each way to Newark Liberty Airport. For more information, check the Olympia Trails web site. From your home, office or hotel, Super Shuttle will take you door-to-door. The Blue Van will be picking up other passengers at other locations too, so if you’re in a big hurry, this is not your best option. Visit www.supershuttle.com for more information.